While we all can agree that the moon isn't made of cheese, there is something magical about the night sky. Whether it is wishing on the first star of the night or dreaming of flying into uncharted territory, gazing at the night sky can capture a child's interest. 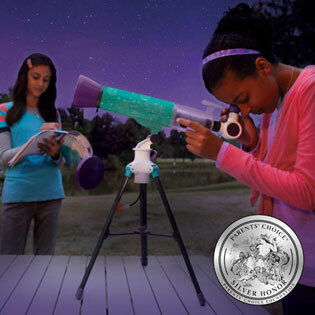 If you are ready to spark a child's scientific mind, the Nancy B's MoonScope can start be the sky gazer's dream. The MoonScope makes looking at the night sky easy for the younger set. With magnification up to 90x, the night sky sparkles under the lens. Whether you want to see Saturn's rings or the mountains on the moon, sky gazers can explore all the night has to offer. With the activity journal, even the novice sky gazer can become more in-tune with the celestial beings. A telescope can let the user travel to faraway places without leaving home. Here are a few tips to make your experience more enjoyable. Experiment with the MoonScope during the day. From looking at trees to buildings, you can learn to focus, which will be easier to use at night. Start with the least amount of magnification. With less magnification, you have a wider field of view to explore more of the sky. Telescopes often provide a flipped view, i.e. left-right. Move the MoonScope opposite to where you want to see. The best part of the MoonScope is exploring a vast sky full of objects. From the moon to the stars, there is so much to see and explore time and time again. The Nancy B's MoonScope can be purchased on the Educational Insights website. It retails for $49.99. The item includes a star gazers activity journal. What wonders does the sky hold? Peak through the lens of the MoonScope and start dreaming. This is so cool! I love looking at the stars and I think this is great for our little ones to learn too! How cool is this. My kids would love looking at the stars, etc!